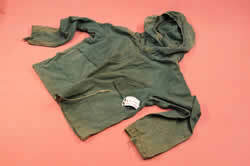 Green cotton cagoule. Drawstring bottom and two button pockets at the front. Four tapes sewn on neck and webbed loop at the back of neck. Drawstring cuffs. From neck 60(l) x 65(w)cms. Sleeve 55(l) cms.